The upper image is the original; the bottom image is my attempt to bucket-fill with tan replacing the gray. This is very close to the minimum threshold to eliminate all of the dark gray, and as you can see, the tan that I bucket filled with is overlaying the white as well… not REPLACING the white, but mixing with it. This has happened recently with a variety of different images, with a variety of different colors both in the images and with the attempted bucket-fills; the result is as if I was looking at the image through tinted glasses, rather than the bucket fill just working on the selected color. I must have accidentally changed some sort of setting… does anyone have any idea what it might be? Lots of guess to do. It would help if you could post a screen print of your entire screen showing tool options, layers dialogue, etc. How are you making the selection? Is the selection still active when you do the bucket fill? Are you bucket filling the original layer, or another layer above the original? For the bucket fill tool options, what is the Mode set to? Is it Normal or something else? Can you give a few more details of your work flow and the settings. A screen shot would be great. There might be different and maybe better ways. This left side, a straight bucket fill of similar colours, leaves a few speckles. Right side is color-select white, invert, fill. Do you want to retain the grey "mottling"? The more information the better. (11-07-2018, 06:56 PM)Blighty Wrote: Lots of guess to do. It would help if you could post a screen print of your entire screen showing tool options, layers dialogue, etc. I’m hoping that this screen cap shows everything you wanted… I have no idea what the etc might be, LOL! I’m not making a selection, I’m just clicking on the bucket fill tool and then clicking on the image, just like I always have. Everything I'm doing is on one layer. I’m still using 2.8, yes. I’m not sure what you mean by workflow, but I posted a screen cap of my various panels. Any settings anywhere else in the program are whatever it came with. The desired result here is pure white undifferentiated spots on a tan undifferentiated background, with no speckles of gray. The problem is that even though the white and the gray are very far apart, the bucket fill is still affecting the white, and not even the way it's supposed to, because it is not replacing the white, it is mixing with it. 3) Select the bucket fill tool. Affected Area must be set to "Fill whole selection"
The bucket fill has two modes: Fill whole selection, and Fill similar colors and . With the first mode it abides to the selection. With the second it ignores the selection (see that second mode as being a combined Select by color+Bucket-fill selection). Since you are using that Fill similar colors option, with a large threshold to boot, the Select by color part selects about everything (and is sensitive to where you click...). 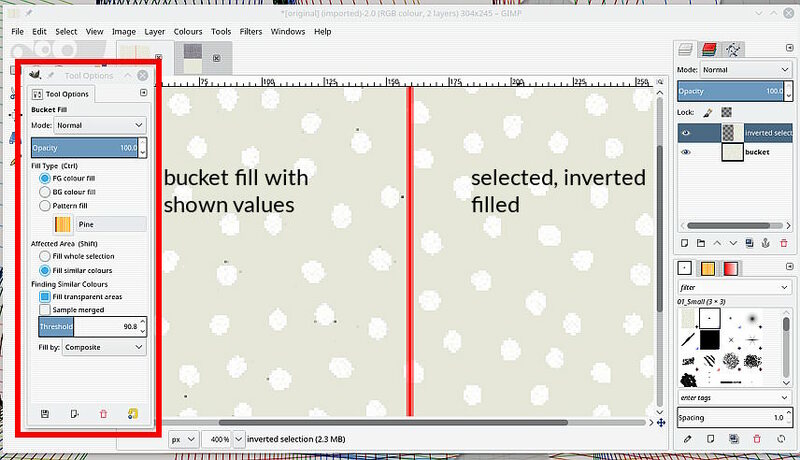 (11-07-2018, 10:33 PM)Ofnuts Wrote: The bucket fill has two modes: Fill whole selection, and Fill similar colors and . With the first mode it abides to the selection. With the second it ignores the selection (see that second mode as being a combined Select by color+Bucket-fill selection). Can we start again from scratch, with the original image, the actual FG color. You can also attach the before and after images (as XCF)? The bucket fill shouldn’t be tinting an entire image EVER, right, regardless of what threshold or foreground color I pick? Based on every article I’ve read, it should either be filling or not filling; I haven’t been able to find any other examples of Gimp behaving this way.